Anyone looking for an application to record, edit and share video clips since Vine announced its imminent closure might be interested in checking out Line Moments, a video-sharing app that was released by the communications entity in October. Line Moments allows users to shoot 10-second videos on their mobile devices, which is already longer Vine’s six seconds. Using finger swipes, users can then edit the videos, adding effects such as slow/fast motion, loop or reverse. What’s more, Line Moments includes a filter function, allowing users to change the textures of their videos in the same way that users do on Instagram. Location information is recorded for each video, allowing users to tag videos on a map. Line Moments can be downloaded free of charge and supports English, Japanese, Indonesian, Thai, Chinese and Hangul. Ricoh has already made a name for itself as a respected maker of 360-degree omnidirectional cameras in the domestic virtual reality industry, with the manufacturer’s handheld Theta series proving especially popular. Ricoh has released a new model of this series called the Theta SC that is ¥10,000 cheaper and 20 grams lighter than the conventional model Theta S.
The camera’s 8GB memory, lens and CMOS image sensor are equivalent to those found on a conventional model. Users can shoot 360-degree omnidirectional photos and videos, transfer them to their mobile devices and post them to social networking services while still on the go. Photos are stored at 14 million pixels, while videos are recorded in a 1920 x 1080 format at 30 frames per second. However, it does not offer live streaming functionality or HDMI interface, and videos must be shorter than five minutes. In short, the Theta SC is a cheap edition for VR beginners. It’s compact in size (45.2 mm x 130.6 mm x 22.9 mm), light in weight (102 grams) and cheap as far as price is concerned (¥32,800, including tax). The camera comes in blue, beige, pink and white color options. 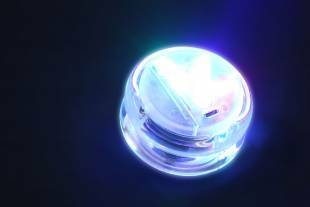 Hardware developer Cerevo has released a yo-yo called 7-Magic that emits light when plugged into a computer. The 7-Magic features 21 LED lights and includes Bluetooth functionality that allows users to set the color and brightness of the yo-yo when connected. In addition, users can link the yo-yo to a video or music that a computer plays, and let the LED lights emit automatically in wireless pre-set mode. It naturally supports not only wireless connections but also includes a USB, which is particularly useful for professional performers. Cerevo worked in conjunction with a specialist Hong Kong firm to create the yo-yo, and developed the toy based on the circuitry of its Nitiator release. Cerevo also hired yo-yo world champion Black from Japan as a development adviser. The yo-yo is 58.25 mm x 39.3 mm in size and weighs 74 grams. The yo-yo is rechargeable, with one charge lasting 80 minutes. The yo-yos cost ¥29,999 (including tax) and shipments are expected to start soon.